A 4-year-old girl was killed and at least three others were hospitalized Wednesday after a stolen truck ran a red light and crashed into another vehicle in Antioch, police said. Pete Suratos reports. A 4-year-old girl was killed and at least three others were hospitalized Wednesday after a stolen truck ran a red light and crashed into another vehicle in Antioch, police said. The suspect, identified as 23-year-old Noe Saucedo of Pittsburg, was arrested and booked on one count of murder and two counts of felony evading, police said. He is being held in lieu of $1 million bail. The collision was reported shortly after 12:47 p.m. Wednesday when the Contra Costa County Sheriff's Office received information of a stolen vehicle in Pittsburg. A deputy spotted the vehicle and followed as it headed eastbound on Highway 4. Authorities said the deputy at the time did not activate his vehicle's emergency lights. A 4-year-old girl was killed and at least three others were hospitalized Wednesday after a stolen truck crashed into another vehicle in Antioch, police said. Roz Plater reports. The suspect vehicle moments later went through a red light at Somersville Road in Antioch and collided into a Ford F-150. 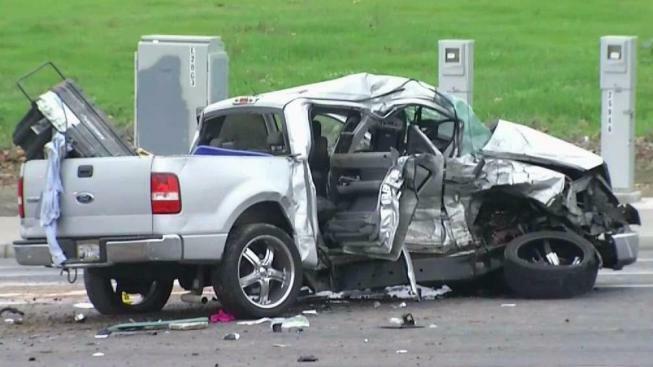 Three people, including two children, who were in the Ford F-150 were transported to local hospitals. A 4-year-old girl later died of her injuries.